The thing about living the country life is that you really have to be self sufficient – it’s not always easy to find help for all the things that need doing. And that includes shearing sheep! 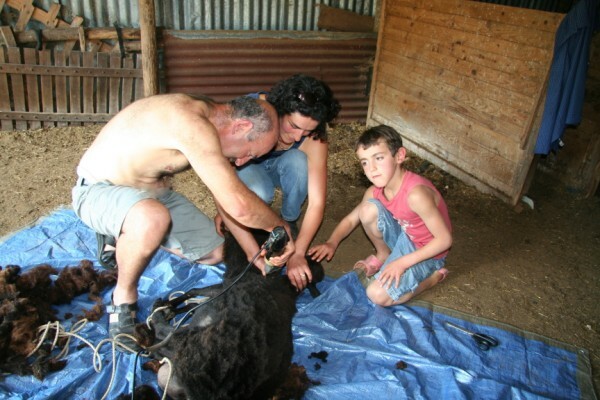 Outsize clippers & a lot of TLC - sheep shearing initiation way back in 2008! 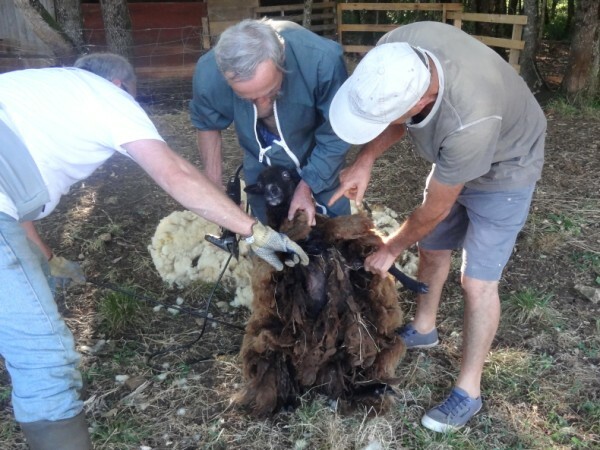 We inherited 3 sheep when we bought Les Crouquets and the first time they needed shearing way back in 2008 we couldn’t find anyone to do it,so nothing else for it but to learn how to do it ourselves – with a bit of a helping hand from a pair of outsized hair clippers. Amar had the daunting task of the actual wool cutting while Alistair and I administered some TLC to the poor sheep, who were no doubt well aware that we were approaching the task with more than a little trepidation. Emma was nowhere to be seen, unable to face witnessing the potential onslaught! Given Buff’s rather impressive horns, I could see where she was coming from. A few guests, obviously braver than she was, gathered round to watch, so the pressure was on to do at least a half decent job! Give or take a couple of minor nicks and a “missing ” tail which was eventually found after a frantic 10 minute search, still attached (thank goodness!) in its rightful position, we reckon we didn’t do too badly! Roll on, next year we thought!! Maybe it was just beginner’s luck as the second time wasn’t quite as straight forward! The sheep, obviously not blessed with short memories,were now well aware of their waiting fate & were agitated. 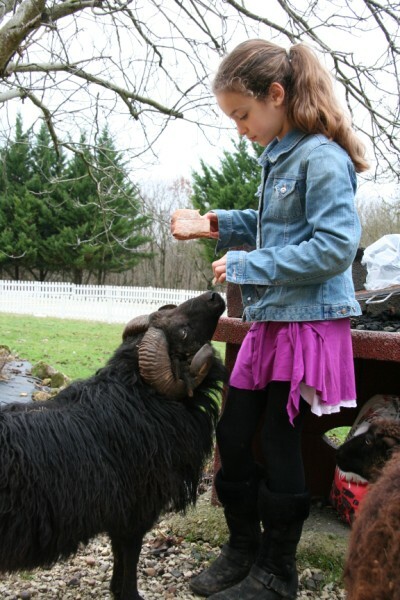 Our sheep are Ouessons with short legs and trying to immobilise them was no easy task! When the clippers broke down halfway through the shearing, Biff took her opportunity to break free and run off down the field, half shorn & way off balance resembling the proverbial haggis loupin’ oe’er the hills ( nice to get back to my Scottish roots again!). We eventually finished the job off with a lot of patience and my good sewing scissors , which of course were completely useless for cutting paper afterwards, never mind material. 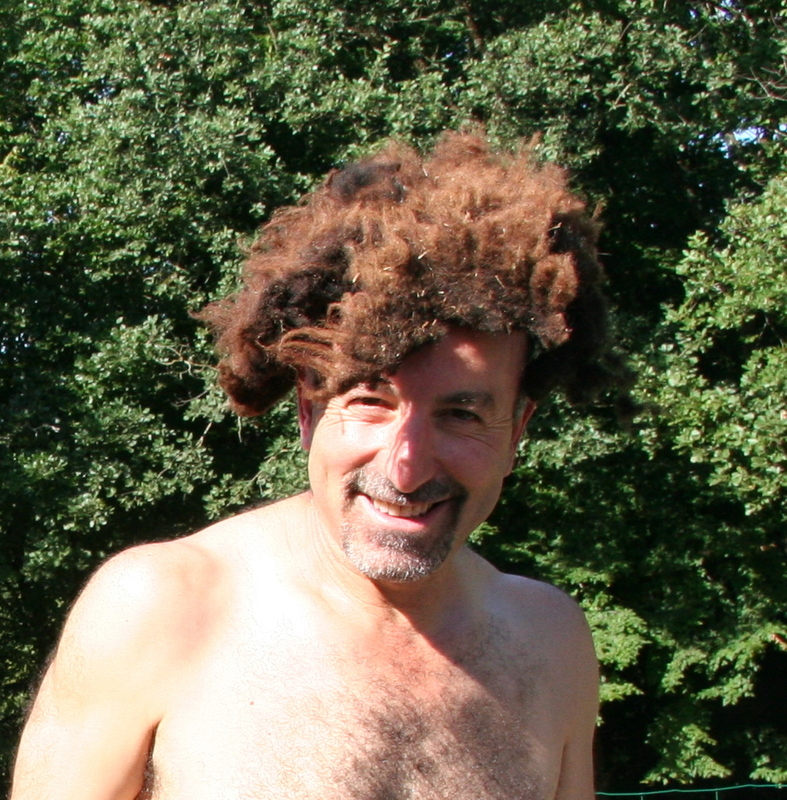 A good use of wool for the follically challenged! 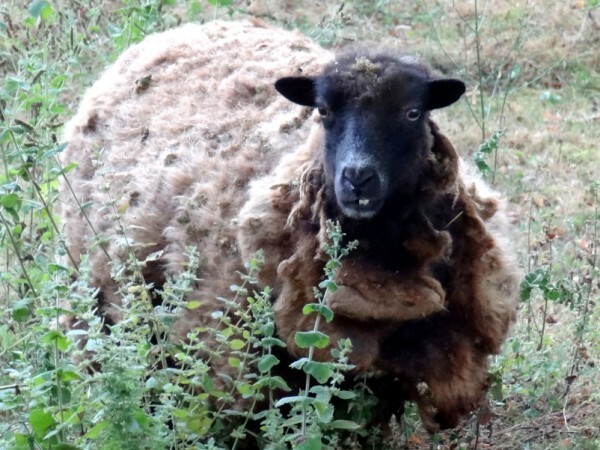 Last year though we couldn’t fnd anyone to shear her and it got too late to do it ourselves so she has had a year’s extra coat to deal with. This was fine in the Winter and during the horrible Spring we had this year but with the recent heatwave she didn’t do too well and was looking decidedly unattractive ,uncomfortable and close to spending the rest of the season in an state of aestivation. * I even overheard one little boy telling his Mum that he wanted to go to look at the scary sheep. 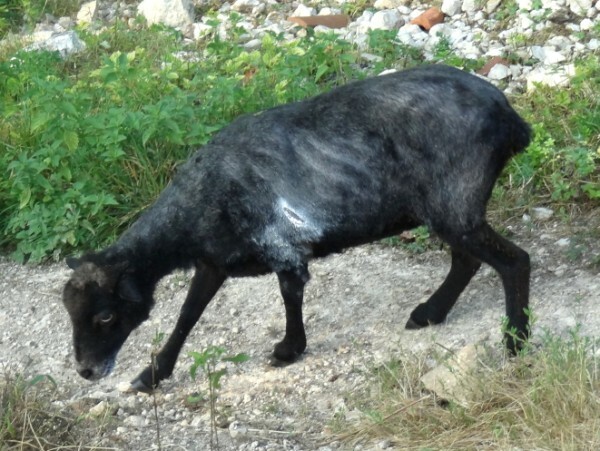 Luckily this week we found someone in the next village who said he would shear her. We loaded Biff, & Alistair for moral support,unceremoniously into the boot of the car and set off to La Cassagne. off to the ovine hairdressers in the boot of the Passat! Two year’s worth of heavy matted wool was never going to be easy but the shearer did a good job and Biff got off lightly with one small nick – actually it looked huge to me and Alistair’s expression must have looked as if she might bleed to death right there in front of us but the ones in the know just smirked at us, sprayed the cut with some cauterizing aluminium and of course she was right as rain. We try to give the impression of being countryfied but occasionally the townie genes will out! Nearly there - 3 men and a scary sheep! Back home Susie and Laphroaig were wary of the new addition to the enclosure – they had no idea it was Biff, now less than half the size and looking more like a little black dog than the rotund brown sheep who had left just half an hour ago! They both became very protective of their patch and tried to chase this intruder off their territory, Susie heehawing at the top of her lungs and Laphroaig,a born hunter, itching to hunt her down but just stopping short, probably realizing that yes, he did sort of recognise her after all. Now I’m thinking that we really should be planning next year’s shearing session way ahead! A big thanks to Carol from Whichwaynow101 for adding this marvellous word to my vocabulary – it’s right up there with two of my favourites, crepuscular and serendipity !! Love the toupe, but poor old Biff! Did he aestivate to get over the shock? No aestivating now Carol!! Biff has definitely got a new lease of life now all that weight has gone!! I want to come and play next time, it looks like piles of fun! Glad to see that sheep are clever and that it is more difficult to pull the wool over their eyes than I imagined. I think you should buy the sheep some Doc Martins then charge an entry fee, you could make a mint! PS aestivation is one of my favourite terms, I do it every summer here. PPS Glad to see we hang around the same street corner, Carol! 🙂 Sounds like a plan! !